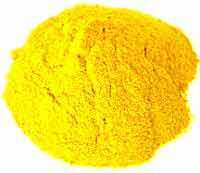 Corn gluten meal, also called corn gluten, is a byproduct of corn processing. Corn gluten is commonly used in cattle feed and dog food as a source of protein. However, an accident in 1986 led researchers at Iowa State University to discover that corn gluten meal possesses the ability to prevent seed germination. Corn gluten works as a herbicide because it has some naturally occuring chemicals called peptides that actually inhibit root formation of a seed at the time of germination. Studies were made to see if applying only the peptides could do the same thing without the cornmeal. Unfortunately the peptides by itself do not persist in the soil long enough for effective weed control. Current research is being done to see if the peptides can be isolated and then packaged in a form where they can be sprayed with better results. Timing of the application is important for corn meal to work. Corn meal must be applied before the weed seeds germinate. Corn gluten works on seeds not established plants. It will not kill a dandelion plant. Corn gluten works on a variety of broad leaf and grass seed weeds. Crabgrass is the primary target, but it also helps inhibit dandelion and clover at time of germination. Since it contains 10% nitrogen, it helps with the greening of grass. It can also be used as a weed and feed, which means that it both kills germinating weeds and stimulates the growth of established plants. Corn gluten meal is applied at the rate of 20 - 40 lbs per 1000 square feet of lawn. Thus, one 50 lb bag would cover about 2500 square feet of lawn. Once applied, the corn gluten meal should be watered in if there is no rain. Once watered, you must allow the area to dry for 2 - 3 days. Plants need dryness for corn gluten to effectively kill emerging weeds. If excessive rains occur, reapplication may be needed. One application effectively suppresses weeds for 4 - 6 weeks. Heavy soils, protracted rainy weather and hot spells may require monthly applications. Because corn gluten meal is non-selective, you must take care not to apply it when desirable plants, such as turf grass seeds, are germinating. So if you plan to overseed or reseed bare areas of lawn, be sure to allow about 6 weeks time between seeding and corn gluten application. Unprocessed corn gluten: very fine, almost powdery in texture. Can be broadcast by hand, but for best results use a hand seeder. It will look like a layer of pollen on the soil. Must be applied directly on bare earth or around new plantings because it can't work its way down through grass or mulch. Unprocessed corn gluten can be purchased from feed stores as an ingredient in dog, poultry and hog feed. Granulated corn gluten: easiest to apply using a spreader. Can also be mixed with water into a paste to use as a patch for localized weed suppression. The patch will keep weeds from sprouting while the surrounding plants fill in. Pelletized corn gluten: can be broadcast by hand. This is an excellent treatment for lawns in spring and fall; a general application will add nutrients to your lawn while discouraging the growth of new weeds. The corn gluten herbicide makes a big difference for those who don't want to use chemicals, and that's a growing number of people.